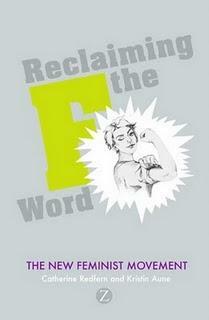 I went to the launch event for Catherine Redfern and Kristin Aune's book Reclaiming the F Word at The University Women's Club. When I signed up to the event on Facebook, I just assumed from the name that this was perhaps a part of the University of London and was expecting to just wander down the road from where I work and into a student union building. On closer examination (i.e. after some Googling) I discovered it is a private members club in Mayfair, and perhaps an unusual place to host a gathering of rowdy young feminists! Slightly pleased I'd worn a nice frock for the occasion, I set off from work to catch the tube to Green Park and finally meet a woman I've admired for a long time. When I first discovered The F Word website in 2001, it was quite a revelation. Full of articles by young women on a variety of subjects from a feminist perspective, it satisfied my need for something intelligent and 'bite-sized' to read and also inspired me to write. I wrote seventeen feature and review articles for the site over the next couple of years (you'll find me listed as Lorraine Smith on the contributors page) and every one was sent to Catherine Redfern before publication. We never met, as I lived in Manchester at the time, but we chatted a bit via email and so I was a little bit sad to see her step down as editor in 2007. However, this was because she wanted more time to devote to writing a book with Kristin Aune and so I was keen to see the results of all her hard work. Last night I got my hands on a copy of Reclaiming the F Word and Catherine kindly signed it for me. Everyone in that room was there to celebrate the work Catherine and Kristin had done, but also to celebrate feminism. The mood was one of excitement, hope and optimism. Now the book is out there, we can all help to promote it and get the message across that feminism is not dead or outdated. After finally getting to say hello to Catherine, I caught up with Helen and Hannah and then, surprisingly for someone who is usually extremely shy in many social situations, I chatted to a lot of new people. People I've encountered online but had never met in person. People I admire. I met Sarah Barnes who is the brains behind the fantastic Uplift Magazine. I said hello to Holly Combe who has written an outrageous number of articles for The F Word site over the years. I chatted to Suraya Sidhu Singh, editor of Filament Magazine, about the magazine and the lack of decent 'boylesque'. I said hi to Jess McCabe and promised to write for The F Word again soon. I even approached Laurie Penny and told her how much I enjoy reading her blog. I'd been discussing with Hannah earlier in the evening about how it was Laurie who helped me understand my privilege, so it was wonderful to be able to say hello in person... although the wine seemed to help me forget all the eloquent things I wanted to say! I started reading the book on the train home and I'm really impressed so far. However, as I'm a notoriously slow reader, please don't wait for a review from me before you buy yourself a copy. Come on, join the gang. Let's reclaim the f-word!